OpenWRT is a highly extensible GNU/Linux distribution for embedded devices (typically wireless routers). Unlike many other distributions for these routers, OpenWRT is built from the ground up to be a full-featured, easily modifiable operating system for your router. In practice, this means that you can have all the features you need with none of the bloat, powered by a Linux kernel that's more recent than most other distributions. This means it must have used the oldest technology in router management, which is the command line. Today, it has graphic user interface reducing the boredom of text in command line technology. If you are considering this type of router firmware, you should be sure that you have the skill to install, navigate and effectively operate it. If not, the other two firmware should be your choice. The advantage of the firmware is its compatibility with many routers. Instead of trying to create a single, static firmware, OpenWRT provides a fully writable file system with optional package management. This frees you from the restrictions of the application selection and configuration provided by the vendor and allows you to use packages to customize an embedded device to suit any application. For developers, OpenWRT provides a framework to build an application without having to create a complete firmware image and distribution around it. For users, this means the freedom of full customization, allowing the use of an embedded device in ways the vendor never envisioned. E-Lins H700 Series Router is the Dual Core CPU Gigabit and powerful high performance of Dual SIM 4G router designed for critical infrastructure, M2M, IoT and industrial applications. E-Lins H900 Series Router is the Dual Core CPU Gigabit and powerful high performance of Dual SIM 4G router designed for critical infrastructure, M2M, IoT and industrial applications. E-Lins H820QO Series Router, with IP67 IP68 grade for outdoor installation. 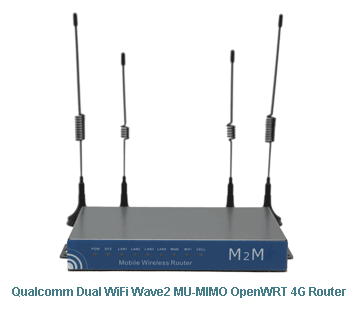 It is the rubust and high performance of 4G / 3G router designed for critical infrastructure, M2M, IoT and industrial applications with Qualcomm solution.